So you are a shooting enthusiast who wants to look good and be the attention grabber at the shooting range? Well, the answer lies in dressing according to the shooting dress code which most of the shooters do not know about. Whether you are a new adventure freak or a seasoned shooter, there are some pro dressing tips that you should absolutely follow when you step out for a shooting adventure. When it comes to the right outfit to wear at the range, safety and comfort come as the prime considerations. Also, you need to be well covered so that the dust, grime and debris do not cause damage to your skin. It is also important to note that the dressing etiquette for the range remains almost the same for men and women. Here are some tips for dressing to help you choose a cool outfit while you go to the shooting range this summer. Shirt: If you are dressing up for a summer shooting spree, only a shirt will do for the top wear. However, you may need to layer it with a jacket or windcheater if the weather gets chilly or wet during the summer. Whether you choose full sleeves or half sleeves is up to your preference, though full sleeves are considered better to protect you from dust and insect bites. Women should low-cut and above-waist shirts as they can attract unnecessary attention. Wear a shirt that is comfortably fitted; a tight one can be uneasy while a loose one can hamper your movement as you swing the gun. Cotton is the best fabric for the range wear shirts in the summer because it keeps you cool and easy. Pants: Pants make a suitable option in bottom wear, even for female shooters. They are comfortable and easy to move in and you can easily bend and lie down. Jeans make a good alternative to pants if you want to sport something that is rugged and easygoing yet smart and trendy. With pants too, you need to be careful about the fit as one that is not well-fitted will restrict your movement and make you feel uncomfortable too. For summers, choose a lightweight fabric that absorbs sweat and does not get too sticky because of the heat. Hat: A hat is an optional part of your shooting outfit though it makes things much easier on a sunny day and also improves your visibility if the sunlight is hampering vision over a distance. Moreover, it protects your hair from dust and dry winds. Like the other pieces of clothing, the hat should also be fitted snugly. It should have minimal gaps to give full coverage. A cotton cap looks fashionable in summer while you can wear a warm, tweed cap in winters. Shoes: Besides the right attire, the right kind of shoes makes another critical element of your dressing code for the shooting range. A comfortable pair that is meant for walking or hiking is the best for people who want to spend long says at the range. Getting a good fit is of utmost importance otherwise you may end up with sore feet and ulcers. Make sure that you pair them with right socks and carry an extra pair of shoes and socks just in case you get them wet or soiled. Shooting Backpack: Though a backpack does not exactly make a part of the shooting dress, it is something that you cannot miss. You need one that is large enough to carry all the gear that you may need. Check out Omaha Outdoors: Outdoor equipment to know about the gear that you should be able to in your range backpack. Ensure that it has good capacity along with plenty of pockets for organized storage and is comfortable to carry. Without any doubt, you should choose your range outfit with great care because safety and comfort come first but this does not mean that fashion should take a backseat. 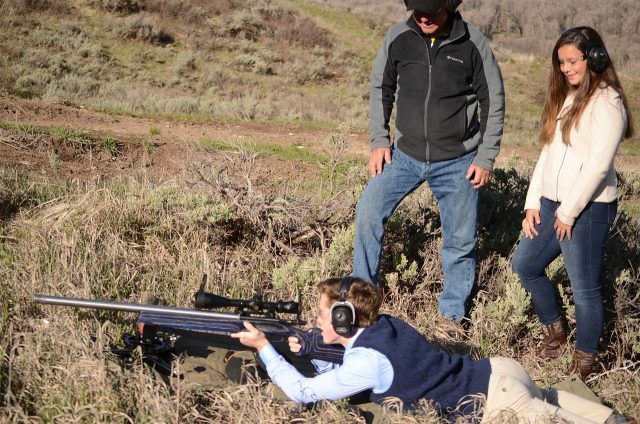 You may even need to follow a dress code in some ranges because many of them specify how members should dress up when they take a shooting trip there. Considering these factors, it becomes imperative that you look the best even at the end of a tiring day at the range. There are several well-known sports brands that offer trendy styles in shooting range dresses for men and women. You can visit their brand stores or explore the latest trends online to be a star at the range. This article has been submitted by Erica who is an marketing writer working with Submitcore, She is a self-professed shopaholic & full-time reader who loves travel photography.